Gluten intolerance and coeliac disease are spectrum conditions. Full coeliac disease requires a strict adherence to a gluten free diet to manage this lifelong condition. Gluten intolerance is a less intense condition and may change as the overall health of the individual waxes and wanes. Once you’ve been diagnosed with coeliac disease, it’s advised that your condition is monitored on a three, six and twelve month basis before moving to an annual review if no problems arise. The reason for the follow-up checks is to ensure that you haven’t developed any other heath implications. There are several conditions that are linked to gluten intolerance and that may emerge before or after diagnosis of coeliac disease. The rarest, and most significant, are Hodgkins and non-Hodgkins lymphoma (a form of cancer originating from white blood cells called lymphocytes) and a slightly increased risk of cancer of the small bowel. Slightly more common are unexplained infertility and an increased rate of miscarriage. It’s important to note two things when considering conditions associated with gluten intolerance – the first is that the conditions listed above are linked to undiagnosed gluten intolerance so diagnosis is a major step towards avoidance or management of them, and the second is that there is no reason to believe any person who is gluten intolerant will develop these, or other conditions, but regular follow up health-checks are designed to catch all such conditions at the earliest stages. Dermatitis herpetiformis is often known by the initials DH and it’s an uncommon (one in 10,000 of European population) skin condition that is linked to the gluten intolerance spectrum. The reason that the two conditions are linked is that many DH sufferers exhibit skin intolerance but not gut intolerance – in other words, the same underlying condition (malabsorption of gluten) manifests in two very different ways. Treatment for DH in the short term include emollients and steroids to reduce symptoms which are red raised skin patches, often with blisters that are itchy and inflamed. 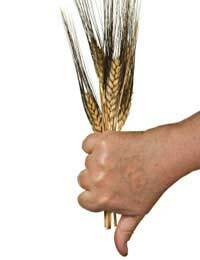 In the long term the only effective treatment is to remove the trigger by excluding gluten entirely from the diet. Lactose (milk sugar) intolerance is often seen in people who have coeliac disease. Symptoms of lactose intolerance include nausea, bloating and abdominal discomfort: a symptom range very similar to gluten intolerance. In newly-diagnosed or undiagnosed coeliac disease there can be a lactase deficiency – lactase is the enzyme that digests lactose and it is found in the villi. The villi are the gut linings that are damaged by gluten, so in the early stages of diagnosis, lactose intolerance may persist until the villi are restored to health. If your discomfort continues, talk to your dietician to find out if you may be permanently lactose intolerant. Osteoporosis has a long and complex relationship with coeliac disease because it seems that gluten has some association with maintaining the calcium density of bones. Osteoporosis arises when bone density drops through lack of calcium, so you may be asked to have a bone scan when you are diagnosed as gluten intolerant, to see if you need to have better calcium and vitamin D intake. You may also be advised to take more regular weight-bearing exercise, to stop smoking and to reduce alcohol consumption as both nicotine and alcohol can deplete calcium.